Ujima (oo-JEE-mah): Collective work and responsibility: Helping others within the community. As I was reflecting on the principles of Kwanzaa, the one that stands out to me the most is Ujima. While I believe that all of the principles are important, this one speaks to me the most due to my passion concerning our community regarding our health. Unfortunately, African-Americans are disproportionately susceptible to many diseases that can be combated with a proper diet. Diabetes is 60% more common in black Americans than in white Americans. Strokes kill 4 times more 35- to 54-year-old black Americans than white Americans. Nearly 42% of black men and more than 45% of black women aged 20 and older have high blood pressure. Additionally, according to the Centers for Disease Control, heart disease is the leading cause of death for people of most ethnicities in the United States. However, African-Americans have the highest death rate percentage at 25.8. As you can see, these numbers are definitely alarming and my sense of responsibility to the community comes in the form of writing daily about the many health benefits of veganism. Veganism has definitely gained momentum within the past few years and continues to make headlines as many well known public figures have openly credited a vegan diet as the catalyst for achieving better health. With documentaries such as Forks Over Knives exposing how important our diet is to our overall health, many more are taking note and making changes. It is my goal to continue to demystify the vegan diet and prove how accessible and delicious this lifestyle truly is. I know many feel that veganism is extreme, but so are the many diseases from which we suffer when we don’t reflect more on what we put on our plates. We should all hold a sense of responsibility to educate ourselves and our children about the importance of whole foods. I encourage those that feel it would be too difficult to become a vegan, to at least cut back on meat consumption. I say if you can change just one thing that will benefit your health, you are one step closer to feeling better and ultimately living a higher quality longer life. There are a plethora of resources, recipes and restaurants popping up all over the place dedicated to helping people understand and embrace vegan living. So, I would encourage you to include some vegan dishes in your Kwanzaa gatherings this year. Need some inspiration? The Vegan Peace Blog provides an exhaustive list of vegan creations you can find here to make for your Kwanzaa celebration and beyond. 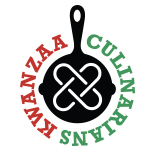 I wish you a wonderful and thoughtful Kwanzaa and a prosperous and healthy New Year! Christa blogs daily at Veggin’ Out with Christa. and is a weekly columnist for GoodVeg. You can also find her on Twitter and on Facebook. She is also available for health coaching and speaking engagements. This entry was posted on December 18, 2011 by The Duo Dishes in 2011, Personal Story, Ujima and tagged Christa Shelton, good health, health, Kwanzaa, Ujima, Vegan, veganism, Veggin" Out with Christa.